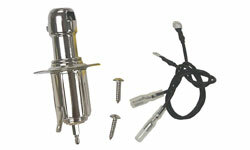 Includes element, case, socket, mounting bracket and hardware. Protect your boat from damage while docking at night! • 30,000 cp. bulb illuminates below the deckline. Makes nighttime docking SAFE & EASY! • Newly-designed housing is FULLY sealed! Old-style O-ring nolonger needed to seal hull. • ALIGN & CHANGE Eyeball from EXTERIOR of the hull. Just loosen set screw to align or change Eyeball. 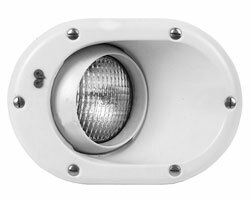 • ELIMINATES the need for access to the rear of the installed Docking Light! 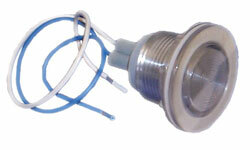 • New Eyeball WILL fit into “old-style” Docking Light housing! • New-style housing will fit existing cut-out with only slight modification. • Mil-Spec sealed WATERPROOF/DUSTPROOF rocker switch panel included. • Intended for Docking Only, Not for Continuous Use.